Find it surprising though not unusual. Last Thursday night, in the midst of a blizzard, a collection of players and spect-actors created a forum in the Museum of Non Participation. Within the space of the gallery, we enacted a play, Bertolt Brecht’s The Exception and the Rule, whose very subject was on trial. 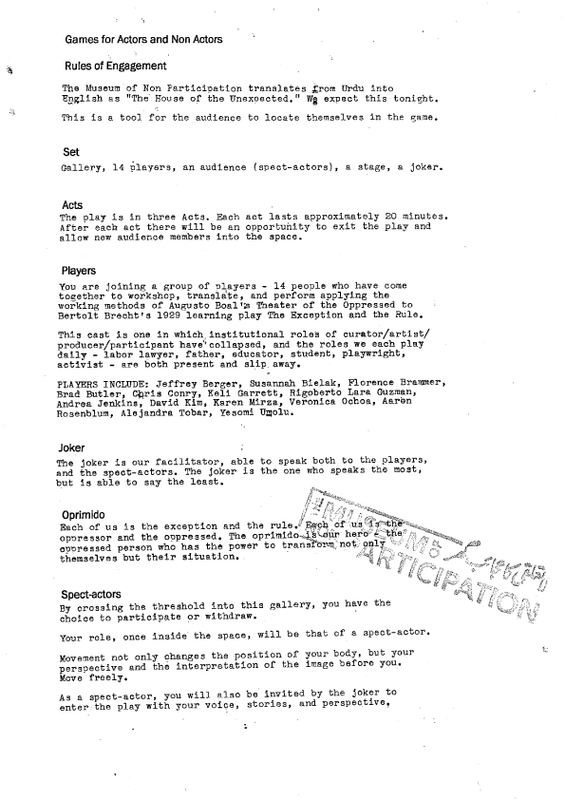 Within Brecht’s play , the “rule” implies a legal language or a directive, while the “exception” evokes being ungovernable or searching for an alternative to either the state or the free market. Together, they act as both a statement, that “the rule cannot exist without the exception,” and a question, as to what a state of exception might be. Through the story of a merchant and his servant, The Exception and the Rule explores themes of capitalism and economics, labor and hierarchy, legislation and state ideology, hiding and secrecy, and the lack of union rights. 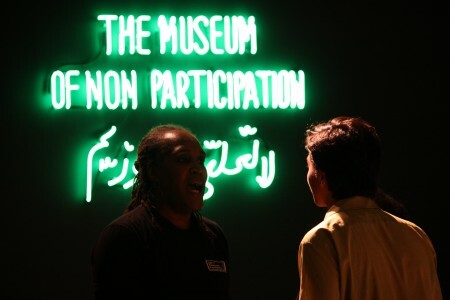 As described in our prior post, a significant part of Karen Mirza and Brad Butler’s engagement at the Walker and in Minneapolis was working together with Twin Cities’ citizens to translate this play, using methods of Augosto Boal’s Theatre of the Oppressed in a series of four day-long workshops. The performance—presented as a one-night only event–was the culmination of this immersive work. How do you take process-based practice and the intimate space of a closed workshop to the open and very public space of the gallery? These were the challenges and the risks at play as we presented our interpretation of the play to an audience of between 80 – 120 people. Within the performance, there were formal contradictions between flow and rupture. Ruptures came from literally breaking out of Brecht’s tale through freeze frames and Forum Theater. Through freeze frames, players and audience alike were able to pause and silence the performance in order to interject narratives/opinions/discontents from their own lives and experiences. In Forum Theater, a real event was enacted in which the spect-actors were invited to take up the position of the oprimido and re-imagine the scenario, in order to affect change. cajoled, nursed, pushed into…..forgetting a—l-l of that mess-s-s-ss-s-s-s-s-s-s-s-s-s-s-s-s through ….. In conclusion, we find ourselves in a contraction, in the space of having generated new modes of language, and acknowledging the limits of language. There’s an inability to find a means to speak to all of the registers on which this work operates–mute, voiced, gestural, political, social, personal, anguished, agent. A reconfiguration of nosotros, the Spanish for WE. There is nos, the subject “we”. This is the people with power [the oppressor, colonizer, privileged] contained with-in—– hyphenated —–yet in constant exchange with the other, el otro, the oppressed. I add the @ to have both-genders-in-one and in order to neutralize the masculine predominance that exists within the Spanish language. This can’t be the conclusion. The performance—an ephemeral, manifold act—was, and is, experienced through a host of positions (of body, perspective, etc.). We acknowledge that this work can only be documented collectively. We invite you to join us in the process by adding to the comments stream below.